Confession: Retro 51 is not the sort of pen company that I like. I strangely and perhaps misguidedly want an emotional attachment to my pens and this requires one of the following a) manufacturer with a romantic or storied history, b) a detailed account of how the pen is made and c) who made that pen. You get none of that with Retro 51; the company makes a few pen models with tons of designs; there is no about page and very little company info on the Retro 51 website. The Tornado is Retro 51s most popular model and comes in many different designs; they come in lacquer, leather, various metals, and crossword designs and so on. The one I will be reviewing is the Lincoln Copper EXT version which features an antique brushed copper finish. When I first saw this pen I immediately wanted to touch it. The antique bushed copper finish looks fanatic, similar to that of an old penny. I cannot think of another pen with a similar finish. The cap features the knurling at the top, which is the Tornado’s signature feature. 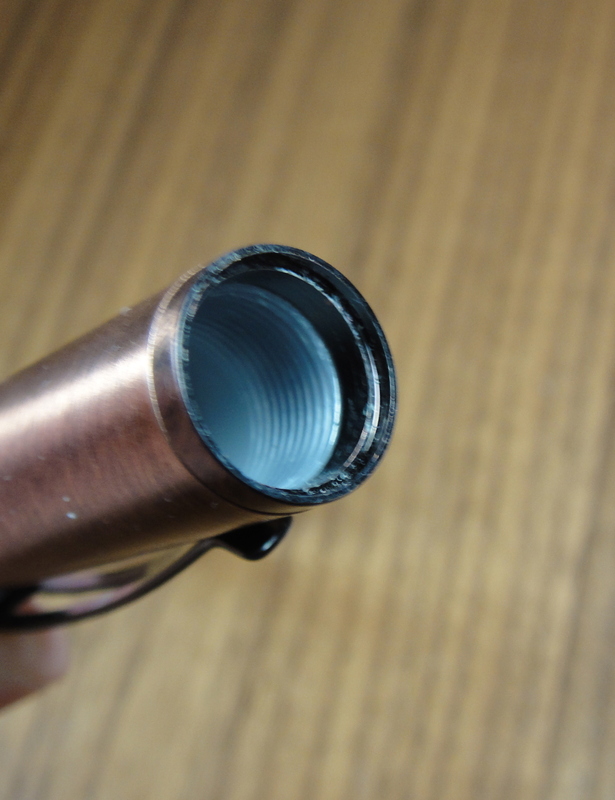 The copper is brushed at an angle and is consistent on the cap and barrel. At the top (just under the knurling) and bottom of the cap is a darker bushed copper, which is bused at a slightly sharper angle. Despite its thin appearance the clip feels very strong. 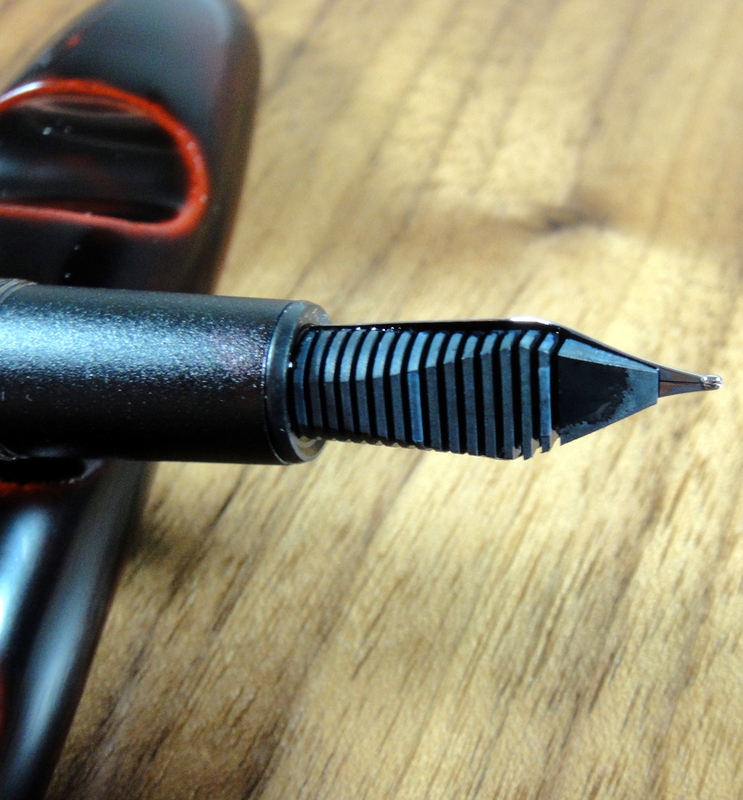 Under the cap is a big stainless Schmidt nib and a matte black plastic section. I would have loved to see an ancient copper colored nib with a Retro 51 logo but at this price point it’s not a huge deal. Overall, I like the Tornado’s appearance; it is very casual looking but in a good way. If you are looking for a pen a diplomat would use, this isn’t it. Plastic threading in the cap. 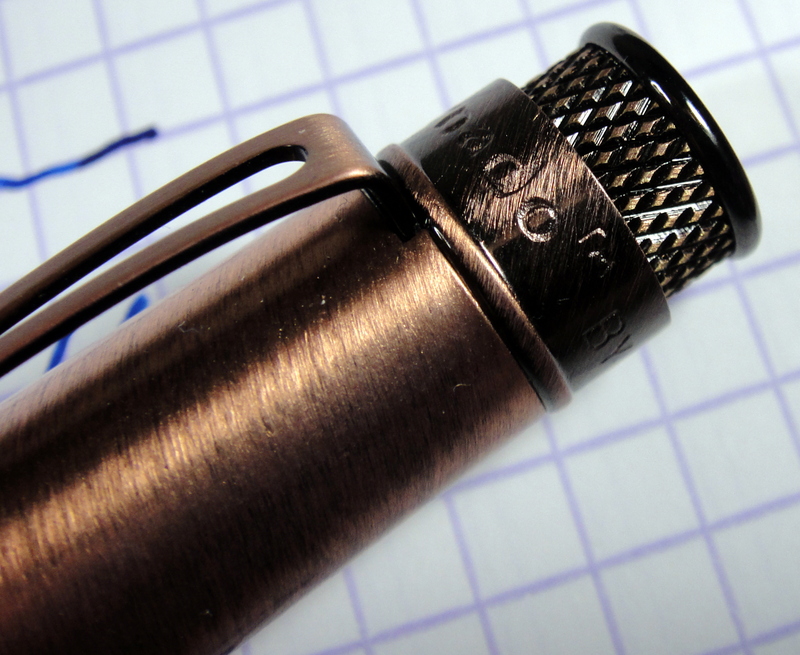 The weight of the metal body gives the pen a nice feel in hand. The threading on the barrel is metal and the threading on the inside of the cap is plastic. The twisting the cap on isn’t the smoothest but I haven’t found it to be distracting. The section threads are poorer and don’t feel nice in use. The nib and section look to be completely unmodified Schmidt components which is an indication that they didn’t put a lot of thought (or money) into making this pen a fountain pen. The matte plastic nib section looks cheap but feels fine to the touch and has no seams that I can see. 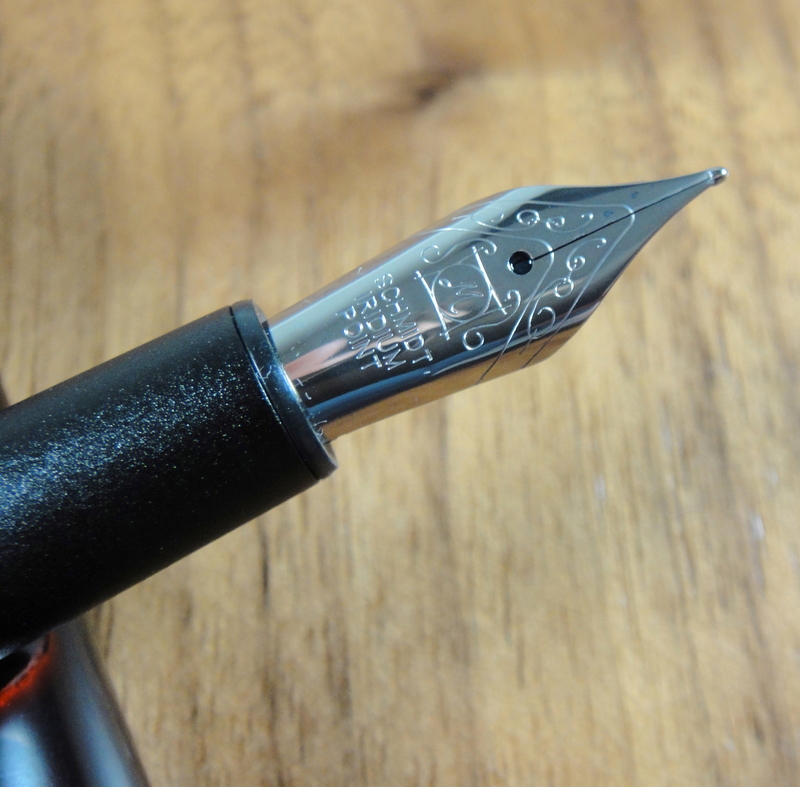 The Schmidt nib has a plastic feed and is a bit out of alignment. While there clearly isn’t much handiwork used to produce the Tornado, I cannot really fault it too much at this price point. Are the best materials used? no, and while plastic section really doesn’t belong, everything on the pen is decently made. The Tornado measures approximately 5.5″ capped, 6.5″ posted and 5″ uncapped. It weighs just under 33 grams with an empty converter. The cap weighs about about 15 grams with most of its weight at the top of the cap and unfortunately this results in a poorly balanced pen when posted. I believe that its size, uncapped, will be comfortable for most people. The cap does post nicely but I do not recommend doing so other than to jot down some quick notes. My Tornado came with a medium point Schmidt nib and it writes quite well. The nib is smooth and the flow is ample. I have had no issues with skipping or hard starting and I have left the ink in the pen for over a month. The feed is a bit out of alignment but I found no performance issues. The grip section is big and comfortable making this pen a good candidate for long writing sessions. The nib isn’t a nail but it is stiff and like most nibs in this price range, does not have a ton of character. The Tornado uses a converter/converter filling system. It was nice to see that a Schmidt converter was included with Tornado. I used the Schmidt converter in my tests and it works well and holds a good amount of ink for a converter but it isn’t a show piece; it is all plastic and its body isn’t as crystal clear as other convertors I have used. The plastic feed is large and was surprised by the mileage I got from dipping the pen. I can almost fill an entire A4 page before it ran out of ink. 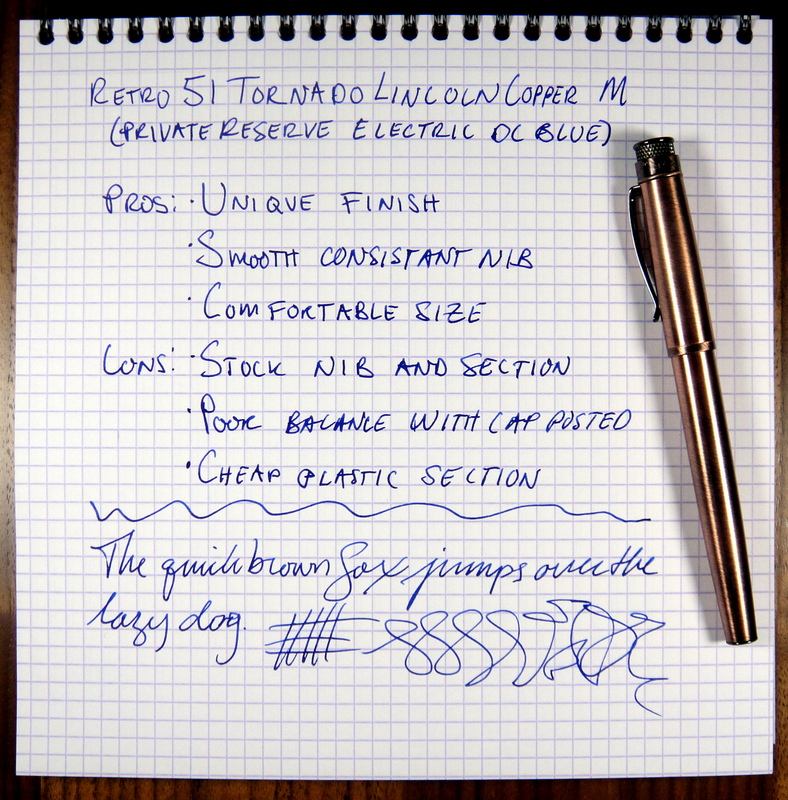 The Tornado in Lincoln Copper costs about $50 and in the $15-75 price range it is really about looks…when you start getting up to the $100 mark some pens will have more distinctive features like gold nibs, or piston fillers and so on. Retro 51 didn’t modify the Schmidt nib and section and while that isn’t a deal breaker, it definitely does not make the $50 price tag easier to swallow. 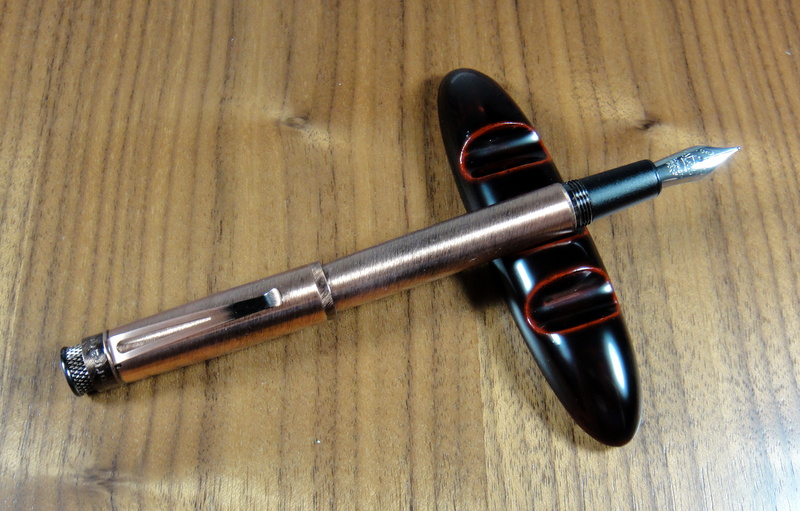 The Copper finish is unique and if you love the look I could see shelling out the dough for this pen. I definitely recommend the Lamy Al-Star/Safari or Pilot Metropolitan over the Tornado as a starter pen because they give you more value for your money and have nibs that are easy and cheap to swap. Please note: this product was provided to me at no charge by Retro 51 for review purposes.